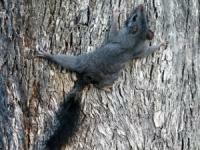 Brush-tailed Phascogale Photo E Collins This animal was found in an upright concrete gate post. It was an overnight refuge. Photo E Collins This animal was found in an upright concrete gate post. It was an overnight refuge. 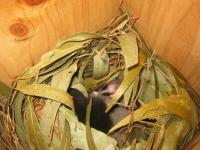 Brush-tailed Phascogale or Tuan Phascogale tapoatafa Photo E Collins Phascogales defecate in their boxes. See piles in foreground. Photo E Collins Phascogales defecate in their boxes. See piles in foreground. 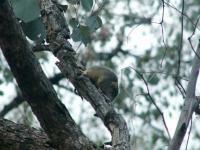 Common Ringtail Possum Pseudocheirus peregrinus Photo M Kerr The importance of conserving hollows is paramount for many creatures. 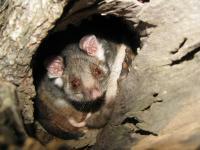 Photo M Kerr The importance of conserving hollows is paramount for many creatures. 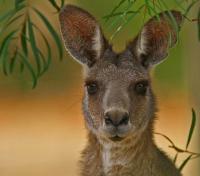 Eastern Grey Kangaroo Photo N Bartlett An exquisite portrait. Photo N Bartlett An exquisite portrait. Echidna Photo N. Blair Echidna enjoying a dip on a warm day. 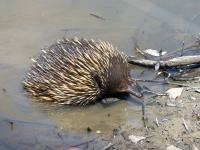 Photo N. Blair Echidna enjoying a dip on a warm day. Echidna Tachyglossus aculeatus Photo E Colllins When disturbed Echidnas curl up and burrow into the soil or stump hole as here. 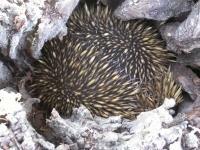 Photo E Colllins When disturbed Echidnas curl up and burrow into the soil or stump hole as here. 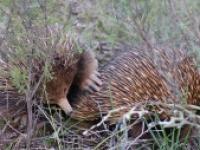 Echidna Tachyglossus aculeatus Photo E Colllins These were caught at breeding time! Photo E Colllins These were caught at breeding time! Squirrel Glider Petaurus norfolcensis Photo E Collins Nest box occupant. Photo E Collins Nest box occupant. Wallabia bicolor Albino-Wallaby-3 Photo D Woolcock Note the lone dark spot on the back. Photo D Woolcock Note the lone dark spot on the back. 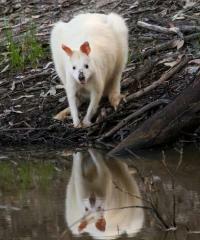 Wallabia bicolor Albino form Photo N Bartlett A rare form of the Black Wallaby captured showing its beauty. A treasure. 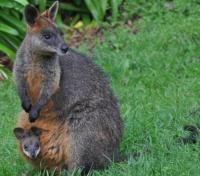 Photo N Bartlett A rare form of the Black Wallaby captured showing its beauty. A treasure. 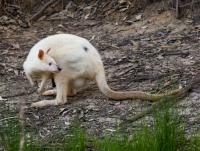 Wallabia bicolor Albino form Photo David Woolcock This is the first in a series of four magnificent photos of our White Wallaby. 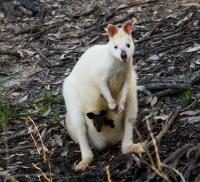 here we are privilged to see the dark joey. 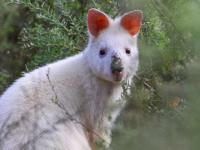 Photo David Woolcock This is the first in a series of four magnificent photos of our White Wallaby. here we are privilged to see the dark joey.